Auto Detailers For Over 20 Years! 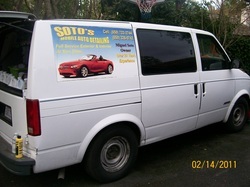 Miguel Soto is a professional auto mobile detailer with a focus on luxury foreign and domestic autos. Any Type of Car or SUV/Truck same price: Jaguar, Maybach, Aston Martin, Bentley, Ferrari, Maserati, Mercedes, BMW, Lexus, etc. Miguel's been servicing cliente on the Peninsula for over 20 years. His clientele live in Atherton, Menlo Park, Palo Alto, Los Altos, Portola Valley, Woodside and Redwood City! Email Miguel Today for an Appointment!